10-Mar-2005 -- Benefiting from a 4-days-stay in Etruria, a small city located in the province of Cordoba, Argentina, I visited this confluence together with a locally-based agronomist named Marcos. The confluence is about 25 kms away from Etruria. The day before the visit we studied aerial photographs from the region around the point of interest to work out how to reach the point. The landscape from the point for 200 kms to the west and about 500 kms to the east is completely flat, sparsely populated and mainly used for agriculture. 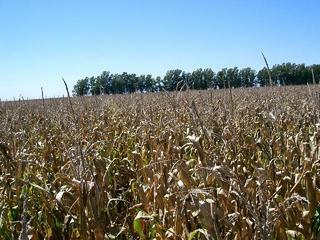 The confluence turned out to be located in the middle of a cornfield (maize). Increasingly worse paths led us to a point 400 meters away from the confluence. The rest was walking - crossing a soya field and entering the cornfield. Watching only the GPS device I reached the confluence - not noting that I was standing in the middle of a ant-hill :-(. The used GARMIN GPS 12XL which I was using showed exactly S 33° 00.0000, W 63° 00.0000. According to the manual, the positioning accuracy is 15 meters. #4: This proves that we've been there!